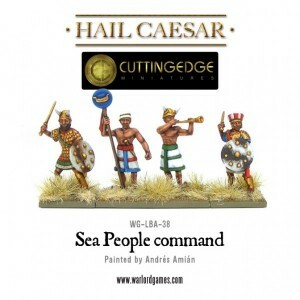 Warlord Games expands their Hail Caesar range with the release of their new Sea People Command set. Lead your Bronze Age Sea People into battle with this new command group. The figures can be used in all Sea People tribes’ armies, including the Peleset, Sherden, Lukka, Denyen and even Trojan armies. It is not known whether the Sea Peoples carried standards into battle, and if they did, what they looked like. However, as many wargames rules and lists allow for them, a standard bearer is included in this pack. The standard is based upon New Kingdom Egyptian representations of a warship (etched onto a ‘solar’ disc); which seems appropriate for a Sea People army who arrived in similar warships to invade Egypt at the end of the Late Bronze Age. Ho ho ho ho... "I know that laugh..."